Ray and I got an opportunity to accompany three men with ancestors who lived in the Smokies to a site like those their forebears inhabited. So on a beautiful January day, Ray and I accompanied Ed, Paul, and Gene on an outing up Injun Creek to visit some old homesites and graves. Gene's family resided along this small but beautiful creek, and some of Paul and Ed's ancestors hailed from nearby sections of the Park. Each of the three had unique stories relating to this area before it became part of GSMNP, and each has invested in studying their family histories as those relate to the Park. So, it was a treat to accompany them on this off-trail venture to an area that Ed and Paul had recently explored and found of interest. Most of our route followed an old roadbed, much of it too overgrown for us to use, up to a place known locally as "Hat Rock," where we viewed a small headstone, probably marking the final resting place of an infant. 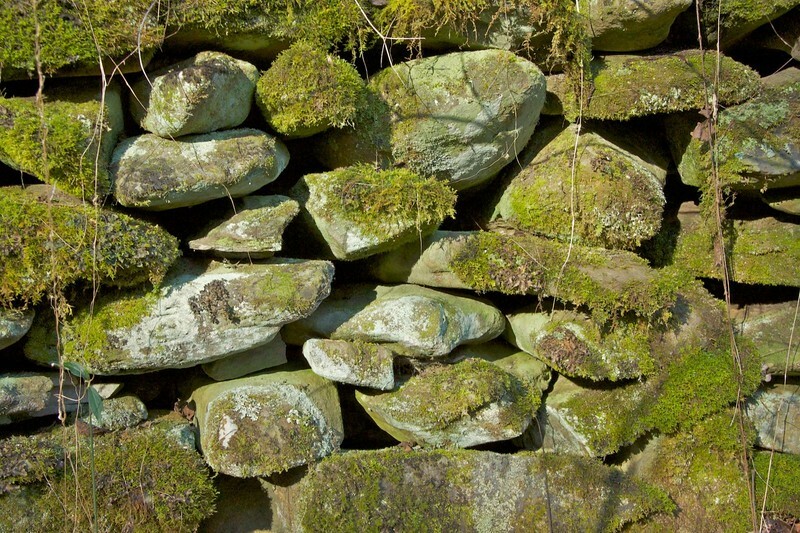 The moss is flourishing on many of the rocks - a testament to the length of time since they were placed here.